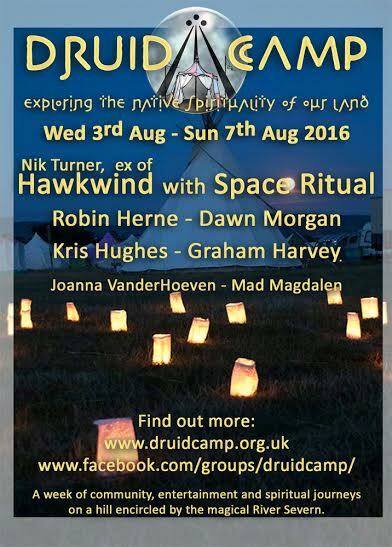 This camp for anyone interested in Druidry runs from Wednesday 3 August to Sunday 7 August on a hill encircled by the magical River Severn. Over the course of five days it offers lots of opportunities to learn about connecting with our land, our roots and our communities. 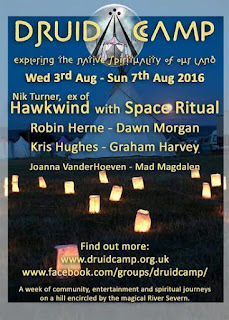 The theme of this year's camp is divination and I am going to be one of the team, offering tarot readings. There will be plenty of other activities including talks, workshops, a healing area, a sweatlodge, rituals and entertainment. This year’s headline act is Nik Turner’s Space Ritual. Full tickets (Wed-Sun) cost £130.00 for adults, £25.00 for children up to 12 and £40 for teens. Weekend ticket (Fri-Sun) are £110.00 for adults.